i dont really get this one… can someone explain? 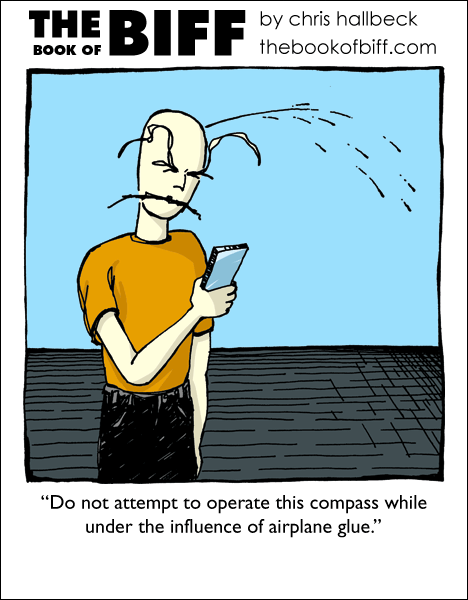 Industrial glue makes the compass talk to you and can try to convince you to vote third party. Me not understand, me from old Europe. I must agree with the confusion of “Fenix”… neither type of compass looks like what Biff has in his hand…? Perhaps if he still had the compass sticking out of his blood-spurting head? he’s holding the back of the glue pack. That’s why one should consult product warnings BEFORE using a product. Dont pop a- ah, crap. Too late again. There is blood squirting from his head. So your confusion, while humorus, is imensely pitiful. It looks like his brain is using the bathroom. I’m a major physics nerd and i didn’t get it. So… shut up… before i unleash my… physique on u… nerd. Still don’t get it… Airplane glue? whassat? The stuff they use on airplane models? It’s a good thing he has spare heads! Wow. Biff has some really high blood pressure. Maybe he’s stressed. Doctor: *hitting him in the hea dwith hammer* GET ME A FLAMING HAMMER! Doctor: omg this glue is flammable! Nurse: don’t hit him with the flaming hammer!!! The airplane glue is from the movie “Airplane!” in which the guy says he has to stop glue sniffing. the airplane glue is that which model airplanes are made. It contains many VOC’s that will cause you to get high when sniffed. i am a mathsphysics student, what does this have to do with maths?? ?